Oxjam’s Newcastle arm have become a busy team in the last couple of years, hosting a diverse range of fundraising events across the north-east to help further Oxfam’s cause. On Saturday 21st October, they’re returning to venues across the Ouseburn for their latest Ouseburn takeover, with five venues hosting over forty acts, with music going from 1pm to 2am the next morning. The Cluny hosts the main stage, featuring performances from atmospheric popstar Cape Cub, the alt-rock of Scalesia and local indie favourites Slurs amongst many others. Downstairs in Cluny 2 is a more playful line-up that includes the brass-powered folk rock of Dansi and the synth-pop experiments of Human X amongst some more hippie-inclined acts. Down at Little Buildings, there’s a more alternative leaning bill that features electronic hip-hop producer B-Type, the post-punk of You Are The Dead and the songwriting of Adam Littlemore (to name just a few), while up at The Cumberland Arms you can catch a bill headlined by The Voluntears and A New Nowhere. In Ernest meanwhile, there’s a plethora of singer-songwriters, with This Little Bird and Bugman amongst their number, as well as after-show DJs keeping the party going until late. With tickets starting from £8, there’s plenty of bang for your charitable buck. 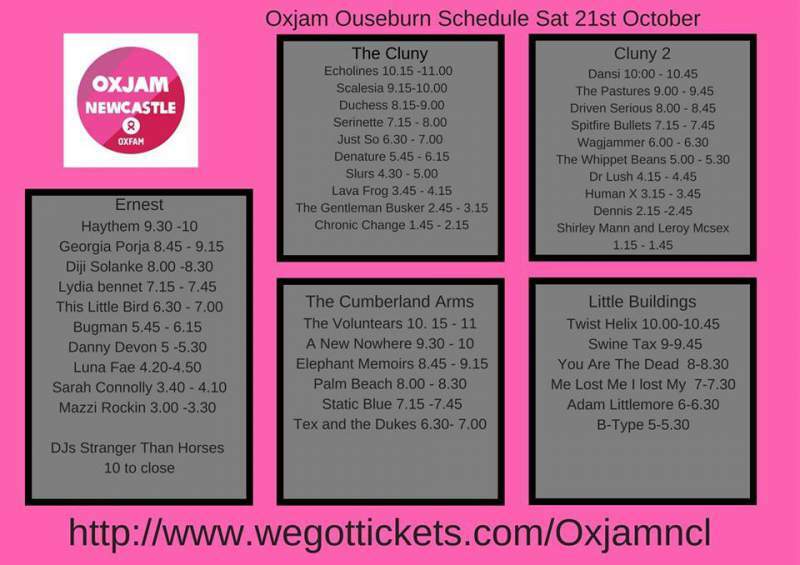 Oxjam Newcastle takes place on Saturday 21st October across various venues in the Ouseburn Valley.